We’re celebrating National Accordion Awareness Month with a look back at some our favorite accordion-focused articles and profiles. But pound for pound, Jeffery Broussard is the best accordion player around. 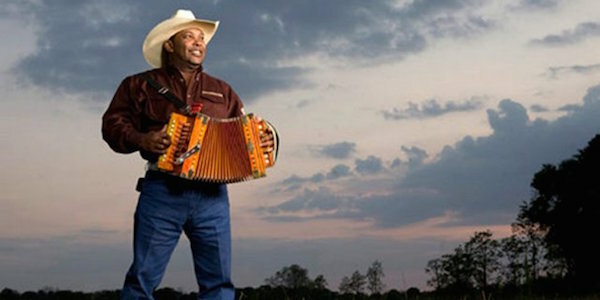 It’s an injustice to refer to Broussard as just a zydeco musician. He can play Cajun waltzes and two-steps, blues, swing, Motown and more. Some of today’s top zydeco stars have studied Broussard’s recordings or even gone to him for lessons. With the 10-button accordion that many zydeco and Cajun musicians play, the thumb on the right hand goes in a strap behind the keyboard. It helps the player hold the instrument while the other four fingers play the keys. Broussard can play with his thumb, giving him a rare five-fingered delivery on the keyboard. At one time, Broussard could play every instrument in his band – except the fiddle. But after being inspired by the young Cedric Watson, Broussard is now a fiddle master too. Broussard’s talents have allowed him to tour Russia, Germany, France and across the United States. Last month, he spent weeks on the road with gigs in New York City and along the east coast before boarding a plane and playing in California and surrounding states. Not bad for someone who dropped out of school in the seventh grade. Born into a sharecropping family, Broussard left school to work in the fields with his 10 brothers and sisters in Frilot Cove, located northwest of Opelousas. Broussard spent long days digging and sorting potatoes. Music was always around as his father Delton was the leader of the Lawtell Playboys band. But when Delton was away, Jeffery would sneak into the house and grab Delton’s accordion. Jeffery taught himself to play. Jeffery later played drums in his brother Clinton’s band, the Zydeco Machine. Clinton let Jeffery play a few songs on accordion, but Jeffery was too shy to sing. Herman Fuselier is music and entertainment writer for the Daily Advertiser and Times of Acadiana in Lafayette, La. Contact him at bboogie@bellsouth.net. Previous post: June is National Accordion Awareness Month!